Secretary of State for Environment, Food and Rural Affairs made the announcement today. The Secretary of State for Environment, Food and Rural Affairs, Elizabeth Truss, is pleased to announce that Emma Howard Boyd has been selected as the Government’s preferred candidate to take up the post of Chairman of the Environment Agency, the independent body which delivers Government policy for the protection and enhancement of the environment. Emma Howard Boyd has been selected following a rigorous process which was validated by an independent assessor from the Office of the Commissioner for Public Appointments. The appointment process was conducted in accordance with the Commissioner for Public Appointments Code of Practice for Ministerial Appointments to Public Bodies. 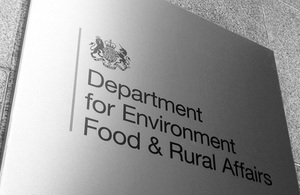 The Secretary of State has invited the Environment, Food and Rural Affairs Select Committee to hold a pre-appointment hearing and to report on Emma Howard Boyd’s suitability for the post. This is in line with the Government’s commitment to strengthen the role of Parliament in scrutinising major public appointments. Pre-appointment hearings enable select committees to take evidence from preferred candidates for major public appointments before they are appointed. Hearings are in public and involve the select committee publishing a report setting out their views on the candidate’s suitability for the post. Pre-appointment hearings are non-binding but Ministers will consider the committee’s views before deciding whether to proceed with an appointment. All appointments are made on merit and political activity plays no part in the selection process. However, in accordance with the original Nolan recommendations, there is a requirement for appointees’ political activity (if any declared) to be made public. Emma Howard Boyd confirms that she is not a member of any political party and has not made any political donations. Emma Howard Boyd is currently Acting Chairman of the Environment Agency. She was appointed to the Board of the Environment Agency in 2009 and was made Deputy Chairman in 2015. As Director of Stewardship at Jupiter Asset Management until July 2014, Emma was integral to the development of their reputation in the corporate governance and sustainability fields. She currently serves on various boards and advisory committees including the Future Cities Catapult (Vice Chairman), ShareAction (Chairman of Trustees), the Aldersgate Group, Menhaden Capital PLC, the 30% Club Steering Committee, the Executive Board of The Prince’s Accounting for Sustainability Project and the Carbon Trust Advisory Panel. Her past board and advisory roles have included being a director of Triodos Renewables PLC; Vice Chairman and Chairman of UKSIF, the UK sustainable investment and finance association, and a member of the Commission on Environmental Markets and Economic Performance, set up by the UK Government to make detailed proposals specifically on enhancing the UK environmental industries, technologies and markets.